Matthew Pickart (M.M. Performance, 2010) Assistant Professor of Music at Webster University, teaching violin, viola, improvisation, and music entrepreneurship, and Director and Co-founder of Clazz International Music Festival in Arcidosso, Italy. He has the distinct honor and privilege of having been able to perform at both Jazz at Lincoln Center and Carnegie Music Hall's Weill Recital Hall. Other career highlights include performances with Grammy nominated Quartet San Francisco as guest violist on their 2017 European tour, Barry Manilow on tour, Bernadette Peters, the Vogues, the Trans-Siberian Orchestra, the Interharmony International Music Festival Orchestra in Italy as featured soloist, the Beatles Love Album Tribute Tour, Rocktopia, Premier Swingtett at the B-flat in Berlin, Ritmo Flamenco in Toronto, and the Swingadje Ensemble as featured soloist on three German tours 2013-2015. His recordings have been broadcast on Milwaukee's WMSE, Pittsburgh's WQED, Lansing's WKAR, and National Russian Radio. In 2018 he was named an honorary artist of the Global Music Partnership. As a soloist, he has appeared with orchestras in the USA, Italy, and the Netherlands. In September 2018, he will open Beloit Janesville Symphony Orchestra's 65th Season as guest soloist for the Tchaikovsky Violin Concerto. As an orchestral leader, Pickart has performed with many orchestras, including as concertmaster of Pittsburgh Philharmonic and principal viola of the International Chamber Soloists. In 2013, he performed as principal violist of the Shirley Givens Alumni Orchestra at Julliard's Paul Hall. As a section player, he has played with premiere ensembles, including the Pittsburgh Opera Orchestra and the Alabama Symphony Orchestra. In 2016, Mr. Pickart created Clazz International Music Festival in Arcidosso, Italy. Clazz has evolved into a three and half week summer educational program incorporating both internationally recognized jazz and classical faculty including Grammy award winners, top crossover artists, soloists, and leading orchestral players. More information can be accessed at www.clazzmusicfestival.com . Also active in new music, Mr. Pickart has worked closely with leading composers such as David Stock and Zhou Tian. 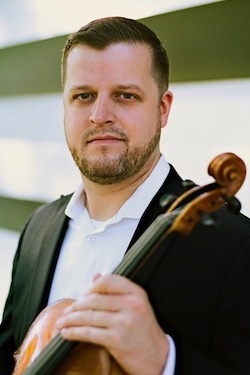 In the spring of 2017, he performed as viola soloist for Steven Mackey's 2007 concerto Groundswell with the Michigan State University's new music ensemble, Musique 21.